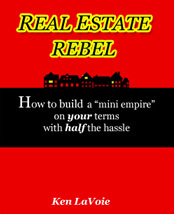 In Real Estate Rebel, Ken lays out a number of strategies that can work for nearly anyone. Single family homes, duplexes, multi-family complexes and syndication. He also reveals some unique money and debt management techniques that can make you richer without doing any extra work. Deb lays out her tenant placement system, which has resulted in their buildings being full of respectable "class act" tenants. Ken went from no real estate experience to fifty units in about three years, and set his systems up in such a way that it's easier to run than you'd ever imagine. He sought out and followed a lot of great advice, but also made some spectacular mistakes, which he identifies so you won't have to repeat them. Ken is an ardent student of the "80/20 Rule" which states that 80% of our results tend come from about 20% of our efforts. And that's what this book is really about...Having all the success with half the hassle. Hey Ken, Thanks so much for sending your book along with the property details. You had me at the first paragraph. About 20% of the way in and appreciating your perspective and advise. This will be my Central Maine real estate Bible :-). Thanks again for your council and kindness. Ken LaVoie started his family's real estate business in 2009 in response to the financial collapse of 2008. He became an apt pupil, diving into his education with gusto and used that education to analyze hundreds of deals and accumulate fifty units in a little over three years. Ken lives with his wife and daughter in Central Maine and runs a landscape business and web design firm in addition to helping to manage the family's real estate holdings. His authorship includes a how-to book on the lawn care and landscape business called "How to start a lawn care business a whole new way" Ken's passions are spending time with his "Best Girls," (his wife and daughter), playing guitar, and traveling.